Thomas Arthur Aston was born on 14 February 1874 at Bilston, near Wolverhampton, Staffordshire, the first of at least four children of iron puddler Joseph Aston and his wife Rosanna (nee Harris). He grew up in Bilston, and by 1892 was working for the Great Western Railway as a telegraph clerk. On 18 January that year he enlisted in the 3rd Battalion, South Staffordshire Regiment (No.2764). It appears however that he was permitted to re-enlist, for just a month later he joined the 5th (Royal Irish) Lancers at Canterbury (No.4022). He gradually rose through the ranks and on 1 May 1899 was promoted to sergeant. Only one disciplinary breach occurred over this period. On 7 March 1898 he was severely reprimanded for disobedience of regimental orders and making an improper reply to the regimental police. However the regiment's adjutant noted that this "does not count as a Regimental entry [under] Para 1922 King's Regs". Aston served with his regiment in India (1894-98) and South Africa (1898-1901) – broken by time in England in 1900 recovering from enteric fever (typhoid) and in 1901 with ague (malaria). He saw action in the Boer War (Queen's and King's Medals with seven clasps) and was wounded at Zoekoe River on 6 April 1901. While in South Africa, on 14 August 1899, Aston married Cork-born Ellen Louisa Fisher in Durban. Over the next eighteen years the couple had seven children. On 20 March 1902 Aston transferred to the 9th Queen's Royal Lancers (No.4729), leaving England for India on the same day. On 20 November 1905 he was promoted to squadron quartermaster sergeant. He served in India until 1906, then in South Africa (1906-07), returning home on 30 December 1908. The annual musketry competitions were decided at Ballykinlar ranges on Tuesday, when "Galloping D," as Dundalk squadron is known in camp, completely swept the boards, winning both the Ashley and Enniskillen Cups, as well as all the individual prizes. Naturally the countrymen feel quite elated with themselves, and it was with difficulty that they held their enthusiasm in check until Wednesday night, when the results were officially made known to the regiment. On Sergeant-Major Aston making his appearance cheer after cheer rent the air, and the cheers were continued with greater volume and enthusiasm as the result of each competition was announced, finishing up with cheers for the officers of D Squadron, Major Hamilton-Russell, Captain Lord Farnham, Lieutenants Ker and Ross, Sergeant-Major Aston, and finally for the recipients of the cups and other prizes, who were afterwards carried shoulder high round camp. At the time of the 1911 Census, Aston was living at 19 The Crescent, Dundalk, County Louth, with his wife and children. In 1912 Aston received permission to continue in the service beyond 21 years – the usual period for retirement – with the regiment's commanding officer writing "[He is a] very reliable N.C.O. and of great value and assistance in the regiment". On 8 January 1913 Aston was appointed regimental sergeant major when RSM Pittaway was promoted. Already aged 40 when the war began, Aston remained at the North Irish Horse reserve depot at Antrim throughout the war. 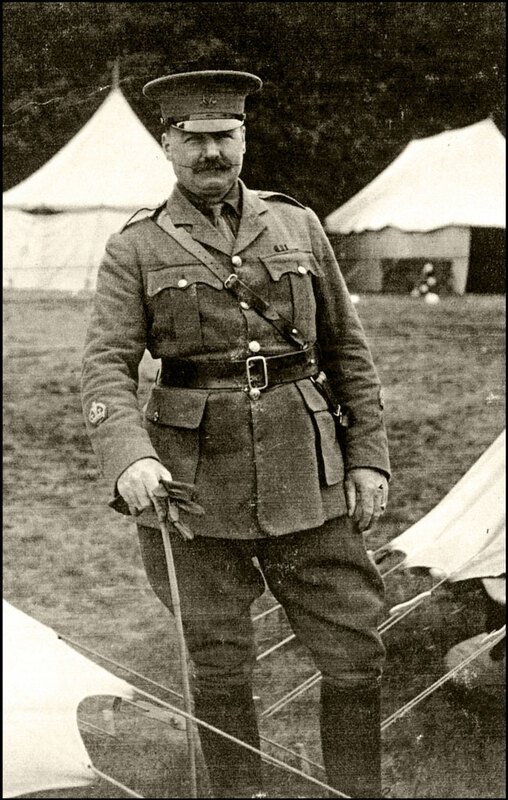 On 14 September 1915 he was commission as a lieutenant and made regimental adjutant. The documents discharging him from the ranks recorded his military conduct as 'exemplary'. On 13 December 1917 he was appointed acting captain (for as long as he remained adjutant). Aston received a number of awards. In 1910 he received an Army Long Service and Good Conduct Medal. In August 1918 his was among a number of names "brought to the notice of the Secretary of State for War for valuable services rendered in connection with the war, and that, when applicable, an entry will be made in the records of service of [these] officers and other ranks." (This was the equivalent of a mention in despatches.) On 3 June 1919 he was awarded an MBE (Military Division). On 31 December 1919 Aston was placed on the retired list on account of ill-health. Aston later returned to England with his family. According to the 1939 register, he was living in Potters Lane, East Barnett, Hertfordshire, and working as a private enquiry agent. He died on 26 April 1949 at 30 Clitheroe Road, Stockwell, London. During his time with the North Irish Horse Aston authored a 'question & answer' booklet for recruits, some pages of which are shown below. More images of Aston can be seen here, here, and here. I am grateful to Bracken Anderson for providing the pages from Aston's Q&A booklet.